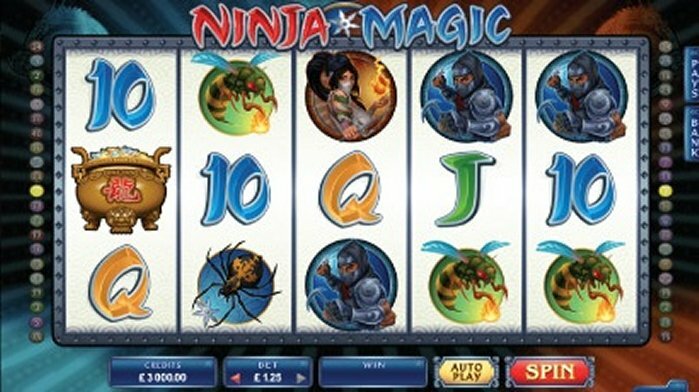 Ninja Magic is a 5 x 3 reel, 40-line online video slot powered by Microgaming. Save the world from the mystical Giant Bugs and claim the bounty of 40 free spins and 8x multipliers. Team up with the ninjas to guide you through the Bonus Temple of Great Fortune. Target the Wild symbols for greater odds of winning, and land at least three Scatter symbols to win big! Spin the reels with a minimum bet of 0.01 and fight off those giant creatures and enter the Free Spins Arena. Unleash spells against the ghastly beings and reclaim the Great Fortune from within the Temple!